NOTE: This post contains spoilers for the Showtime series. 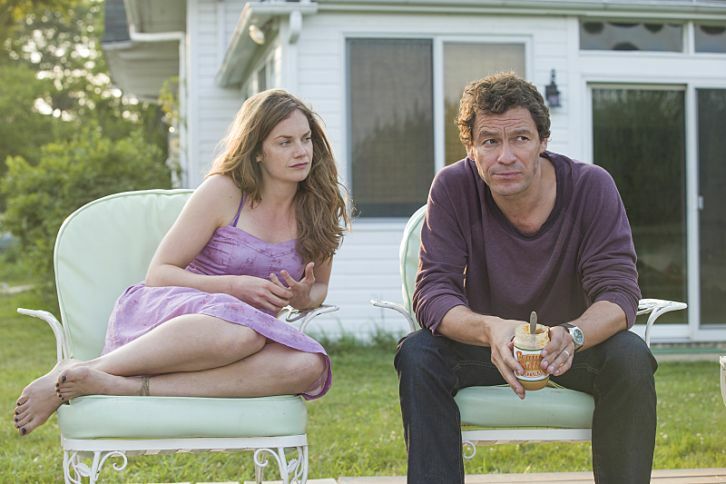 We are introduced to the leads- public school teacher/first-time author, Noah Solloway (British actor Dominic West- best known for The Wire) and a waitress named Alison Lockhart (another Brit- Ruth Wilson- who didn’t LOVE her in the Jane Eyre miniseries!? ), along w/ their respective spouses, Helen (Maura Tierney from ER) and toward the end of this ep- Cole (Joshua Jackson). Though Noah is middle-aged, he is handsome and stays fit by running and swimming (“me time”). In the first scene, a pretty young woman smiles and gets close to him at the local pool, but gracefully backs away when he shows her his wedding band. Later that morning, Helen laughs in Noah’s face during a NOT so opportune moment, which hurts his male ego (no doubt)! Each ep is told from the viewpoint of both Noah and Alison; as co-creator Sarah Treem explained somewhere in between their accounts is the truth. The other co-creator, Hagai Levi, was also one of the minds behind HBO’s In Treatment. As in True Detective (sidenote: I’ve seen some of S1), the story takes place in 2 time periods- the present time (where Noah and Alison are being interviewed individually by Det. Jeffries). Alison mentions her baby daughter and the sitter. Noah’s family includes 4 school-age kids (Whitney, Trevor, Martin and Stacey), including 2 rebellious (you’ll learn JUST how difficult) teens. Noah and Helen seem like a happy married couple; they are still VERY into each other. The family lives in a Brooklyn brownstone, but is going to spend the entire Summer (3 mos.) at the house of Noah’s in-laws, the Butlers. Bruce Butler is a prolific author whose books are now being made into feature films. When Martin complains that he doesn’t like Grandpa, Noah quickly agrees w/ him. On the way to the grandparents’ place, the Solloway’s stop at a diner where they meet Alison, who waits on their table. Alison first makes an impression when she helps save Stacey from choking. Helen was panicking, not knowing what to do, but Alison told Noah the girl had to be put upside down then hit hard on the back. Wow, that was a tense scene! Alison gets VERY affected; she rushes off to the ladies’ room to have a cry, wash her face, then settle herself. Notice how Alison has her hair flowing down and looks more glamorous (wearing makeup, looking tan) in Noah’s account? The camera zooms down to her body (hips, legs) as he checks her out. But in Alison’s account, she has her hair pulled back and is not wearing makeup (looking pale/wan). VERY interesting- we see this difference ALSO in the meeting (by chance) on the beach. Whoa, what about that ending!? It was SO weird, and we can see that this show is going to be dark! Only in Alison’s account do we learn the real story; in Noah’s eyes, it was quite shocking. Noah fantasizes about Alison; when Helen comes in, he says he needs “me time” (LOL). 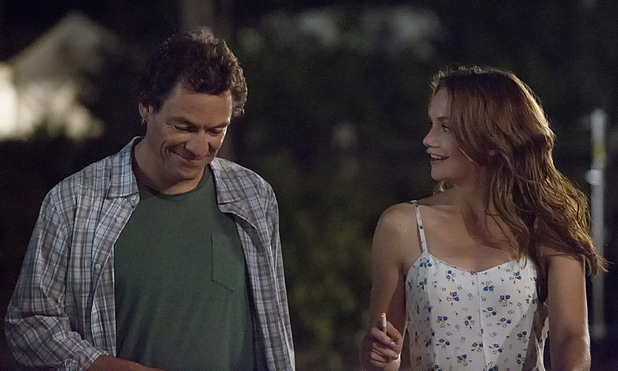 In such a small town/community, Noah and Alison can’t possibly avoid each other. At a farmers market, Stacey wants to get some homemade jam that is being sold by Alison and her young sister-in-law. Martin wants to be a ranch hand at the Lockhart ranch, much to the (pleasant) surprise of Helen. Noah is stunned when Cole rides over to discuss the job w/ the boy! Cole’s mother, Cherry (Mare Winningham), makes a comment about how if Cole and Alison have another baby, she can help. They can come live on the ranch, she says nonchalantly, as if Alison is incapable of handling her own child. Awww… look at poor Alison’s face! So, we wonder if Cherry (deep down) blames Alison for the death of her grandson. At the Butlers party, we learn that Bruce has had a long-term mistress from both Helen (who gets quite distraught) and her mother. As Noah comforts Helen, he spots Alison, who is working as a server. She borrowed a dress from her (thinner/younger) co-worker, so it’s VERY tight and makes her feel uncomfortable. Men are checking her out, including Bruce (ugh). As we suspected, Bruce IS a jerk, who casually undermines Noah in front of both relatives and friends. We learn that Noah regrets marrying young (right out of college); he wishes he had had some time to himself. Helen (need to learn more about her) was beautiful and rich, plus he loved her, so he decided to take the plunge. I’m sure MANY people can relate to this; I’ve heard this sort of comment from those who were raised up in religiously conservative households. Did you notice how in Noah’s version, Alison kisses him first? But in her memory, he was the one who made the first move. Hmmm… Viewers pointed out that Noah (w/ his wife, kids, status, etc.) has MORE to lose than Alison (who’s also married), though they’re both attracted to each other and unhappy w/in their respective marriages. Noah has a lunch meeting w/ Bruce’s editor, Harry (this guy liked Noah’s book); they commiserate re: their situations. Noah pitches a new book idea; it will be about a couple having an affair, but w/ a twist (the woman will be murdered). Also, he will delve into the commercialization of Montauk. The editor looks very interested/pleased about it. And who could miss the irony of the “honest face” comment!? In this ep, BOTH Noah and Alison become more bold/careless (EX: kissing in the library). She said that Noah reminds her of her grandfather who was also a “storyteller.” Lem Gonsalves (Afterbuzz TV) cleverly correlated this to mean that Noah is a liar. Good one there! We learn that Alison is not ONLY a waitress; she worked as a nurse. When she sees the sick little boy and his mom, Alison can’t wait to get out of the hospital. Later on, she cuts herself on the beach (ouch); this is her coping mechanism. There is another mention of Alison’s baby (present time period). We also learn a lot more about Oscar, who not only owns The Lobster Roll, but has plans for expanding his business to include a bowling alley. He was kicked out by his wife, so is sleeping in his office above the restaurant. Oscar is annoying and brash, but he does have some supporters. Cole (and his brothers) as we see at the town hall meeting, are NOT happy about Oscar’s ideas. When Cole mentions their dead son, Alison is VERY shocked/upset, as this seems inappropriate. Noah refers to Alison as his “research partner;” he is still hesitant and conflicted about being w/ Alison. She, on the other hand, wants to be w/ him, BUT is also conflicted. They are also awkward w/ each other, which makes it more real-world (as noted by hosts on Afterbuzz TV); this is NOT usually what is shown re: extramarital affairs. On the ferry, Noah (Aside: Notice how he’s sometimes clumsy?) spills coffee on himself. Then he spots an older lady hugging and chatting w/ Alison, so he hangs back for a while; later on, he lies to this same woman about how he knows Alison (via Helen and yoga- a bit humorous). Yes, viewers, the lying had begun on Noah’s side! 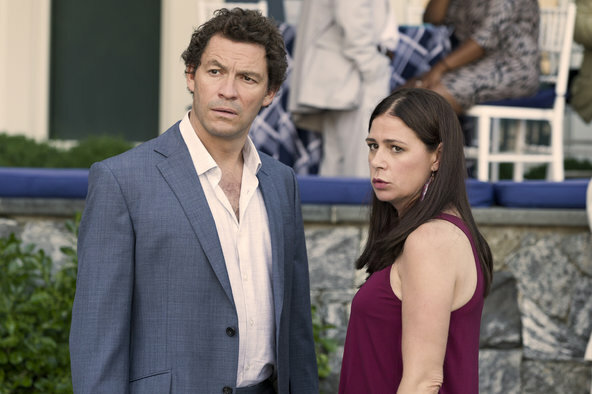 The affair is (FINALLY) consummated on Block Island! But just before that, Helen calls while Noah and Alison are at the bar, and he had to do the whole “I love you, too” goodbye (realistic, yet awkward). As they look out over the cliffs into the ocean (which is a VERY romantic setting), Noah and Alison talk a bit about their past. These two have an emotional connection, and it is getting stronger. The part w/ the mirror where Alison sees herself (w/ a man who’s NOT her husband) was a GREAT directorial move. When Noah notices the scars on one of Alison’s inner thigh, and she gets VERY angry and shuts down; this totally confuses/hurts Noah. I think he’s slowly realizing that she’s not an “easy” or “free-spirited” woman, as he (and we) may have assumed in early eps. The part w/ the dresser (Did you think it was funny/lighthearted or not?) showed us a more mischievous side of the pair. 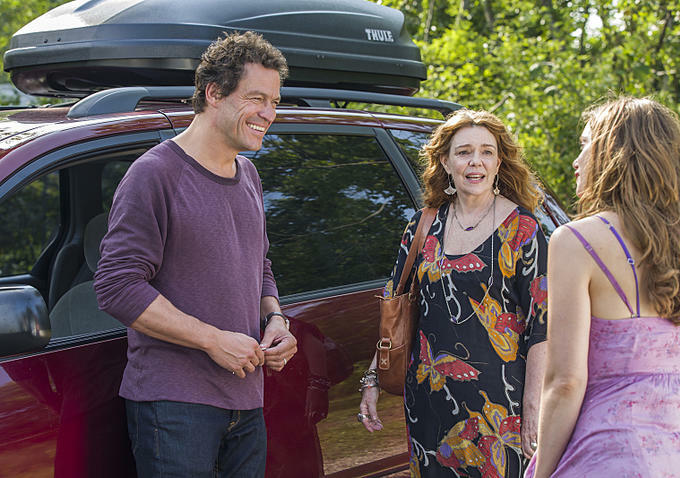 On the way back to Montauk, Alison reveals that she “had a son” (Gabriel) who drowned 2 yrs ago. Awww, such a sad moment! Noah is (obviously) affected by this, being the father to four kids himself. Instead of rejecting her, as Alison expected, Noah kisses her passionately. 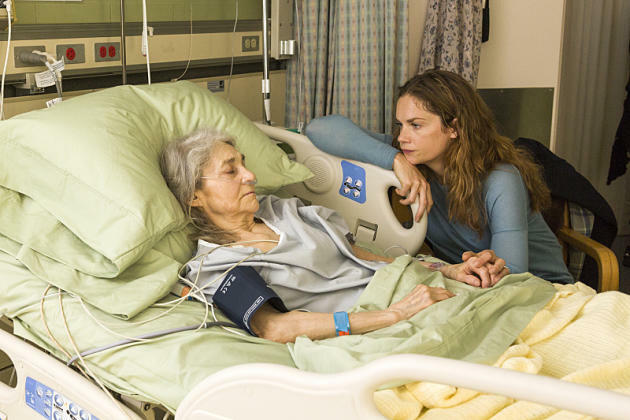 As one reviewer on IMDB, “Noah breathes life into Alison.” Wow, what a GREAT observation! Scotty is the one who died! We finally learn that from Det. Jeffries (in the present time scene). Cole and Alison have a VERY awkward (and almost silent moment) in the early morning when he comes back to get the surfboard wax and instead of sleeping, Alison has put on a a cute dress. Afterbuzz TV hosts wondered if he’s not really surfing, but maybe doing the same thing (having an affair), which hadn’t crossed my mind. To me, Cole seems to be very stuck in his own head when not consumed by the family/family business. Noah and Alison have a rendezvous at her girlfriend’s house (in Ditch Plains); this lady is a musician who usually travels the world and is not around. They both look so eager and happy when they see each other in this cozy/comfy setting. It turns out that Noah and Alison come from similar backgrounds; his dad was a truck driver and his mom was a waitress. Speaking of mothers, Alison’s absentee/carefree mother (who now calls herself Athena- haha) enters the story. We find her at the North Shore nursing home. Grandma (who has Alzheimer’s) doesn’t recognize Athena, but is quite happy to see Alison. We learn that Athena has broken up w/ her latest bf or husband. At dinner, Cherry gives Alison her wedding band. Perhaps she is sensing the tension/trouble between her daughter-in-law and her son? Or maybe she’s just being nice? Athena thinks that Cherry is trying to lockdown Alison to the Lockhart family even more than before; this sparks anger from Cole. He points out that it was HIS mom that took care of Alison after Gabriel’s death, not Athena. I REALLY liked this scene b/c it revealed more about Cole, Alison, their past and both mothers. The scenes related to Whitney’s bullying of a classmate were VERY well done (as well as timely/realistic). Parents often don’t know what their kids/teens are doing online. The Butlers wanted to bring in a lawyer b/c they were (once again) concerned w/ money (ugh). As a teacher, Noah knows just how terrible it can be for picked-on students. I went to see this action film b/c it was FREE (w/ my movie Meetup)! LOL… I’m NOT a big fan of Tom Cruise, BUT I don’t loathe him (like SO many out there). I was (pleasantly) surprised that I had a GOOD time; the same goes for the ladies in my group (we’re ALL female, BTW). I was esp. glad to see a strong female counterpoint to Cruise in the form of Swedish actress Rebecca Ferguson (who plays a Brit). Yes, she’s a beautiful lady, BUT she is also tall, muscular/solid build, and does some AWESOME stunts! Is her character a good spy or a baddie? It takes a BIT of time for that to be revealed. She and Cruise have TERRIFIC onscreen chemistry. FYI: This is her FIRST big movie role. Actress Rebecca Ferguson at a premiere for the film. As for the men, I liked Simon Pegg’s computer expert character- he provided a LOT of the humor. Jeremy Renner- don’t know WHY this guy keeps getting cast in big movies!? The poor guy just has NO screen presence; forget about ever being a leading man. Ving Rhames is underused, as is Alec Baldwin (looking good, as always). Baldwin has one of the funniest lines in the film though. The soundtrack is one of the BEST things about this movie; one (well-known) piece of opera is woven throughout a pivotal scene. Also, everyone likes hearing the MI theme song, right? Check out The Super Fantastic Nerd Hour podcast (Episode 72) if you’ve seen this film and want to hear an in-depth review. SPOILERS: Don’t read if you have not yet seen or don’t want to know details from E9 and E10 (the season finale) of the show. 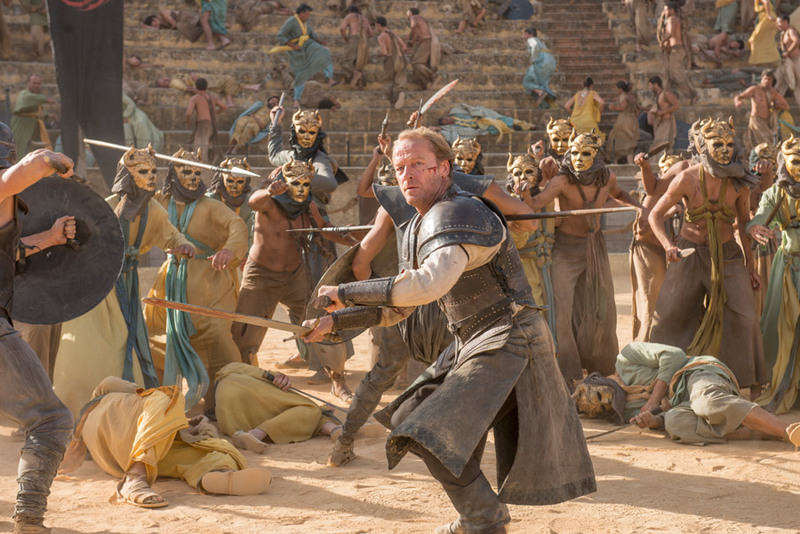 Jorah (Iain Glen) surrounded by the Sons of the Harpy. This was a VERY hard to watch ep (if you’re still watching)! We find out that, just before dawn, Ramsay and a few of the Bolton bannermen came and took ALL the horses. Also, the sellswords (half of Stannis’ army) rode away in the middle of the night. Davos (LOVE him, as always) is sent away by Stannis to The Wall. Davos wonders why HE needs to go when any other man would suit. He gives Shireen a present (a deer he carved out of wood) before he rides away. Poor little Shireen is walked from her tent to a pyre. She cries and calls out for her father, but the soldiers just lower their heads and do nothing. Suddenly, Selyse finds her motherly feeling (FINALLY), but it’s TOO late! Melisandre has already set fire to the pyre. The second half of the ep was like something you’d see in a feature film- WOW!!! How cool was it when Jorah speared Dany’s would-be assassin!? (BTW, where did ALL those Sons of the Harpy hide their masks?) There was some heavy fighting, BUT finally Drogon flew in for the rescue. It was a GREAT ending for the ep! 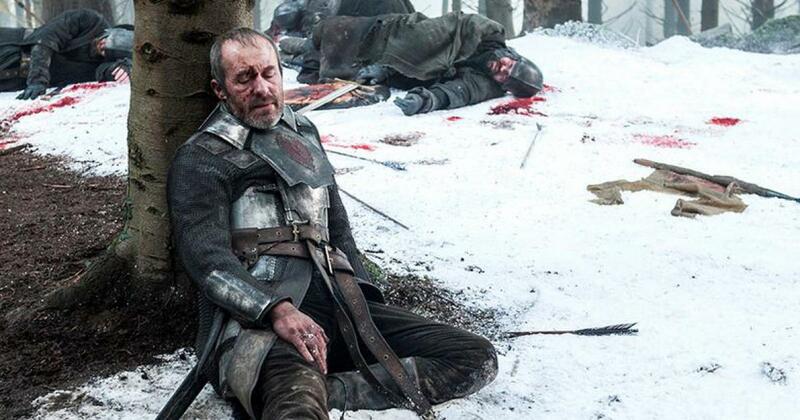 Stannis (Stephen Dillane) realizes that he is defeated. Cersei is (FINALLY) punished! (FYI: They closed a lot of streets on location and used a body double for some of the shots, as Lena Headey is pregnant. I didn’t know re: the double until I heard A Cast of Kings podcast.) Yes, Cersei has done TERRIBLE things, BUT it was tough to see her treated in such a way. What will come NEXT from her, I wonder! Jon (Kit Harington) lies wounded from the MANY cuts inflicted by the Night’s Watch.